Beautifully showcase all of your on-the-go beverages with this Choice 9 oz. clear PET plastic cup! From ice water and fountain drinks to fruit smoothies and fresh-squeezed lemonade, this disposable plastic cup will create an eye-catching presentation for any refreshment. Made of 30% recycled PET plastic material, this cup is durable and crack-resistant, therefore reducing customer complaints due to cracked sidewalls. I purchased these cups with lids and used them to display and sell single cupcakes. Just flip the lid and place cupcake in the center and cover with the cup. I added my logo on top. This is a great option. These cups were perfect for cups of cake with the matching lids! I put frosting in the bottom, topped with cake, more frosting and popped the lid on! Party to go! I loved it and will be ordering many more. The shipping was also terrific! I love using these 9 oz. cups. They're perfect for serving drinks, snacks, or even displaying cupcakes as other users have mentioned. I always like to have these on hand because they're so versatile. These cups have worked out perfectly for my cupcake stand at our local market! I bought the coordinating dome lid and get compliments from everyone. They are extremely durable and do well keeping the flys and heat off my sweet treats. Nice rocks sized glass which is perfect for kids drinks. Also works very well to serve shrimp cocktail in since you can fill the cup with shaved ice and top with shrimp. Love this cup, works well with many applications. Works well with our infused water stands. its sturdy and holds up well. Nicely priced for an eco friendly cup. These plastic cups are wider than anticipated, so they appear smaller. However, they are made of good quality plastic and the lids fit perfectly. We use them as dessert cups. Althought these look great, and are very sturdy, they do not stack well. If you put them more than about 10 cups high, the whole pile starts to lean and tip over. Quality Plastic Cups, clear just liked we wanted. We received our order just two days after placing it. We used some of the small 9 ounce cups as Popcorn Cups. They are the perfect size for snacks. 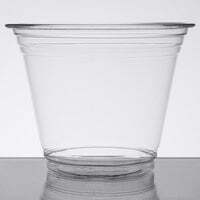 We bought these 9 ounce plastic squat cups for catering larger parties,once we seen how well they held up during the gig, we started using them for desserts, clear and strong. This 9 oz cold cup will work great at our wedding because it will hold lemonade, iced tea and water as well as cocktails. It is durable and has a good lip on it that will prevent spills! Quality! These cups held up great for our event. I did not receive any of them cracked and they were well packaged. I also did not have any issues with the cups losing their shape. I also liked that they were clear and simple so they can go with any decor. We did not try to use these more than once and I would buy them again. This cups are perfect for my business needs. I sell Tres Leches cake on this cups which are strong and durable to store and serve all my customers. I will be purchasing this product again. Stable cups, the size and height make it hard to spill. Would be an adequate cup for kids but also great for adults as they look elegant. Not only for drinks but also snacks. great for beverage stations of bar use. very clean and professional use and I love the case pricing. also very durable, they do not crack very easy. These cups are a great choice for a smaller version of the Choice plastic cups. The same quality, durable, heavy plastic that I've come to expect from Choice. Perfect squat cup. We use this cup for our 9oz smoothie bowls. Love that it takes the same lid as our other cup sizes. Labels and stickers attach to it well! We donated frappes for the children and this size was great! Not too much and not too little. It fits great with the dome lids so we added whipped cream on top. Purchased these for events. They were a bit smaller than we expected, but are perfect for when we are about to close the bar and we switch to plastic for wine and mixed cocktails. The 9 ounce cups are very durable plastic cups. The plastic is heavy duty and bartenders everywhere should know that they will not tip over on there own. They are good quality plastic cups. We use these clear cups and lids to package our individual cupcakes and people are always super impressed with how we package each of our items! These cups are good quality and durable. We use them for farmers markets when someone wants to get a cup of ice that way we save the taller ones for lemonade. Great product! I love these, they are prefect size for mixed drinks, punches and wine. They quality is 100% and hold up for a drink that is at room temperature or full of ice, as well as multiple refills. My recommendation, buy them in bulk, you will want to use them all the time! I love having these cups on hand because they are very versatile and sturdy. The price is excellent too and for the price, you could afford to buy more than one case at a time. I would purchase these again. A great choice to fill pudding and yogurt which I need the whole time. Glad Webstaurant store has this choice and very happy with the quality and the price. Great compliment to the 16 oz size. Can't say enough about how well they are built. They are slippery when wet, but are very easy to serve from. Perfect cups for beverages and fruit salad. I used these cups at a church event and they were a hit! The fruit salad looked scrumptious in the clear cup! I would definitely order again! I bought these cups for my wedding. They are great as an all purpose cup, for soft drinks, wine, beer or cocktails. Sturdy enough to not break if bent. Fantastic product! Ordered all of our disposables from Webstaurant and everything was perfect and price couldn't have been better! The shipping and delivery process was simple. Will be ordering from this website again soon! The Choice 9 oz. Clear PET Plastic Squat Cold Cup is a perfect disposable cup. This size is almost great for anything fruit, deserts, liquid and of course to put a cupcake in. They are a sturdy plastic and not flimsy at all. I highly recommend them. Neat little clear cups. They can be used for drinks, desserts, fruit salad, anything cold or room temperature. You can purchase different lids for multiple purposes. Great small size cups perfect for a child to have filled with a cool summer drink. We didn't have any issues with the cups ripping being punctured or anything. These are nice cups for their price. They will flex, but as long as you aren't gripping them in a death grip they won't break. They are a bit wider at the top than I would like, but they are short. We use these 9oz cups to sell a mini sized root beer float! The parents love the size because it's not too big but good enough to satisfy children! i bought these cups to use for my church and they've worked out great, on our third order now. They're the perfect size for parfaits as well as cold drinks, and I like the smaller 9 oz size to keep people from leaving any liquids when they toss the cups. The only down side is that if stacked more than 15 or so, the stack will fall over since they have a broader opening, but this isn't an issue for us since we only put out a few small stacks anyways. Besides using them for juice at breakfast events, these are great for passing out samples of food like pasta salad at tasting events. Made from quality recycled plastic. Exactly what I wanted. The product arrived very fast so I was very pleased. Great price for the amount of cups you get. I highly recommend. The cups are wonderful. We will purchase them again they are durable. They were a good value for the price. The arrived in a timely manner. This is a nice quality clear plastic cup. Perfect size for punch or cocktails. Nice crystal clear plastic looks nicer than translucent cups. These are made of recyclable plastic too. Sturdy plastic cups that I can use to serve any cold/iced beverages. I love that it comes in individual packs of 50 so it is easy for me to set up. Perfect quality. Perfect size for giving out samples at our coffee shop. I love that they fit the same lids as our 24oz, 16oz, and 12oz cups. Perfect size and the price is greaat. These cups give you the ability to showcase your mixed drinks without breaking the bank or worrying about broken glass. Ordered this 50 per pack with the other 24 oz one. The good thing is this one use the common size of the lid with the other types of the cup. We used these cups to toast the bride and groom at my daughter's rustic, casual wedding. They are very nice cups as far as plastic cups go. A good value. These are good quality, medium weight plastic cups for beverage service. They look nice and are sturdy enough for ice and beverage service. A good economical cup for daily use. We purchased these 9oz cups to give away free samples of our beverages at a food tasting. These worked great with the lids we previously purchased for the 12 oz cups, as they were interchangeable. Perfect! These are great cups for small parties or even waiting rooms. They hold just enough liquid to drink but not enough that they encourage waste. These smaller plastic cups are great for events and sampling beverages. We've also used them for fruit/parfait cups. Bonus they use the same lids as the bigger sizes if you already have those! This cup is perfect for me! I used these cups to hold my home made yogurt. Since I bought one box and have yogurt one cup per person daily. This box is good enough to hold for over one year for my family! Love it! These clear plastic cups are great for our events to use for punch and tea. Highly recommend if considering for the quality and value of the price! These cup are fine. I didn't realize how small 9oz was going to be. They are almost too small for even a kid. Next time I will get 12 oz. Great cups nice and heavy duty great price I bought these for a party and they worked great as drink cups, fruit cups desert cups, and much more. The Choice 9 oz. Clear PET Plastic Squat Cold Cups work great for a cold beverage or snack. The quality is very good for being disposable and the price is very reasonable. I definitely recommend these cups and will purchase again if needed. Amazingly durable with the thick lip on the top and flexible but thick sides. The shape makes it so it doesn't slide out of one's hand either! I wish these were a little heavier weight. The size is deal - they're a very clear translucent plastic - some can be somewhat hazy. Just wish they were a heaver weight. I bought these 9 oz cups to serve drinks at an upcoming party I'm hosting. They arrived unscathed with no damage and I am very happy with my purchase. These are great cups that are strong and very convenient to use. We served wine in these at a recent party and they were perfect.\ Very cost effective cups that are strong. I would recommend them. These are perfect for any kind of sundaes and scoops of ice cream. Very sturdy and looks good. We use them for brownie sundaes and strawberry shortcake sundaes. Purchased these to use along with matching lids for storing cupcakes. Worked for my purposes, but I had to use the smaller cupcake liners than I'd originally planned to avoid smushing the cupcake base. good solid plastic disposable cup and very reasonably priced! perfect for small drinks of serving apps - the lids are great too ad fit multiple sized cups. The Choice 9 oz. Clear PET Plastic Squat Cold Cup is ideal for any type of beverage. It's durable and a great addition for business. These cups are crystal clear and very sturdy. But you might want to keep in mind that they will NOT fit the Dart Solo Dome Lids. These cups are great. The price is unbeatable. They are strong and easy to hold with one hand . It is also easy for young children to hold. I love the size of this cups. Small and clear cups like this make my drinks look fancy for catering events. They hold a perfect amount of liquid so guests can enjoy all the different flavors of aguas frescas without getting full on just one. These 9oz cups are great for our short mixed drinks or liquors on the rocks. We serve alot of these type of drinks since we have a full bar at our bowling center. We started using these cups when we realized that the eco-friendly ones still took eons to decompose and that these were recyclable. Have not had a problem with them at all. We use them for smaller size juices and smoothies and we also turn them upside down with lids to hold individual cupcakes in the merchandising cooler. Standard 9 oz squat cup. Perfect for wine or self-serve water at a bar. We buy these all the time. I get a better price from webstuarant store than I do from my food purveyors. 9 oz plastic squat cup used with a dome lid to make individual cupcake containers! I've been on a search to find the perfect container to hold individual cupcakes as gifts for coworkers and these turned out perfectly! they hold the bottom of the cupcakes and stabilize them and the dome lids leave ample room for decorated frosting. I use these cups for a bake sale for the cupcakes, they are the perfect size for cupcakes. The only thing I noticed or I should say I learned is that I should poke a hole when is hot outside. But that's not the cups fault, but mine. The cupcakes look very nice and professional in the cups. These make great half size, or sampler size drinks. They are short and wide so kind of an odd shape but they are probably best used for fruit cups or parfaits. These items arrived much sooner than expected and was surprised at the quality of the items. They will be used for a party being held in January. Am so looking forwarding to using them. This cups were a hit in my sons birthday party together with the lids! The parents really loved them! They are durable and perfect for small children, even adults! I truly reccomend this cups, i am defenitly buying more for other events! Great product A+! These cups can be used for all occasions. The quality of the cup is very sturdy. These cups can be used for any type of drink. I love this 9 oz cup. elegant without having to use glassware. we use this for adult drinks. Guests are impress!! sturdy and good quality! These cold cups are really nice for the price. They are stronger than I expected for the price and do not need to be doubled. Love them. These cups are wonderful for cold beverages such as juice or lemonade. They are more a more environmentally sound option than some other cups of this variety and are the perfect size for guests of all ages. We highly recommend this product. These are nice, sturdy cups. We used them at a welcome dinner for our wedding. They worked fine for red and white wines, and also gave a smaller cup option for kids at our Italian soda bar. The same lids fit both the 9oz and 16oz cups. It's been difficult to find plastic cups that are actually recyclable. I was lucky to find these in bulk to serve wine and cocktails in for our wedding. They are the perfect size and do not feel flimsy. These cups are great! We use them for all our cold beverages. The accompanying lids fit very securely. I would recommend these over the leading brand. Great cold cups for the price. We serve cupcakes and parfaits with these and have no issues with the seal our the cup. Will purchase again. These cups arrived with no breakage which is a plus. They are pretty sturdy when filled. They look great and can used for beverages or even larger desserts. We used these cups for our kids drinks. Never had any problems with lids fitting or cups being flimsy. Probably 10-12 cups were stuck to another cup and we had to throw both away, but that wasn't enough to keep us from getting them again. This cups are great. I purchased them to sell desserts and they definitely worked. I purchased them along with the lid and they got the job done. These cups were used for serving juice and wine, and they helped keep the party classy! They are the perfect size and they are not flimsy at all. Was very pleasantly surprised by how sturdy these disposable cups were. They are a great size either for children to use, or to use for desserts. Very impressed with this cup. It was very sturdy and "clear" for the price. Along with the lid, cup can be used for multiple crafts. These cups and lids are perfect for selling my cupcakes at the farm market. Customers love the portability of them and think they are so cute. These plastic cups are inexpensive and a great product for kids to use for soda or for small togo items such as rice pudding or yogurt. We started ordering these cups when someone wants just a double of espresso over ice, you aren't waisting the extra cup space like in a 16 oz cup. We bought these for our backyard wedding. Such a great deal for the amount of cups and the quality that we got. Shipping was super fast and all packages (and we got a lot of them) arrived with no problem. Purchased for schools annual spaghetti dinner to use at the bar. Worked great for red and white wine and soda. Just the right size for wine. Will purchase again as durable. Can use these cups for hot or cold beverage. They are durable wont crack and they look great. I will use these cups again for an event. These cups are just as described. I am satisfied with the quality of these cups. The only downside is that the cup is wide and short, which makes the drink look smaller than it actually is. Love these cups! We ordered a case of 1000 for red & white wine and liquor shots for a large party. Our guests actually reused their cups over and over again because of the great quality. I have been looking for awhile for these size cups that had matching lids. Finally my search is over. these will be used for my daughters pre-k snacks. I fill them with grapes and cheese. Kids love them. You cant beat the price either. I use these to hold individual cupcakes when I'm selling them at the Farmer's market. They perfectly fit a standard size cupcake and are crystal clear so customers can see the product. Good quality cups. Great for on the go drinks or for displaying cupcakes for bake sales. Makes for cute packaging with a spoon tied to it. I love these for smoothies but these are my go to cupcake containers for cute favors! I order these every chance I get and for the price and compliments I get, you can't beat them! I was looking for some clear plastic cups to use to serve cocktails and thought these would be perfect. They are much nicer looking than the infamous red plastic cups. They are also a great size for regulating the amount of alcohol that is consumed. These are the perfect size fro my business, it allows not too much ice in the cups, not too much alcohol and are easy to handle for the clients. These cups are so strong and great for serving drinks and food. I served fruits and veggies and also mocktails. Very good quality and already my friends know where to buy in bulk for their next party orders. loving the shopping experience here. Sturdy wonderful cups. I use these for my cake parfaits and they are perfect to take a jumbo cupcake and slice and layer in this cup. These cups are the perfect kiddie size or for people who want a small portion. I love that there is only one size top for the choice brand.